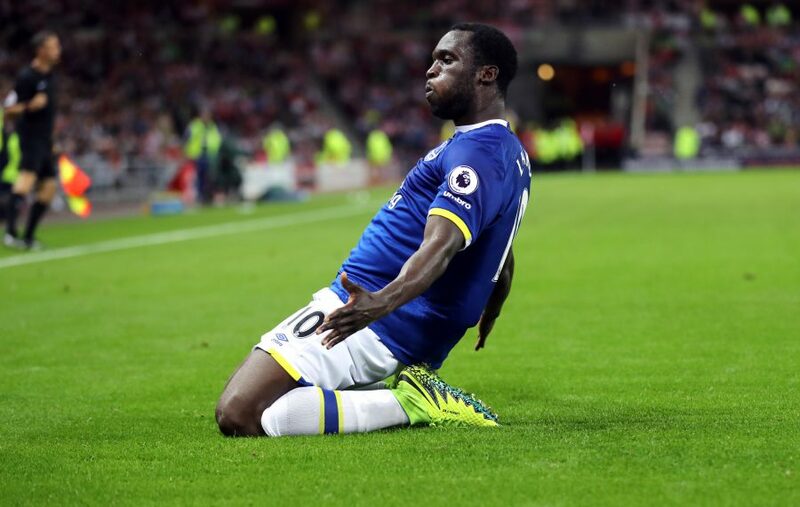 BUT HE DOESN'T RUN ENOUGH: Romelu Lukaku scored a hat-trick in Everton's 3-0 win over Sunderland earlier this season. The old adage goes that “a week is a long time in football”; two weeks without it from an Everton perspective has felt like a lifetime. But breaks can be a positive. After all, had Saturday’s clash with Sunderland rolled around in the midst of a packed festive period or a congested early segment of the season, it’d be greeted with a shrug from match-going Blues. The hiatus has heightened anticipation ahead of David Moyes’ return and that of a band of former Toffees. The break should have done the Everton team good too. Although some debate raged over the benefits of a mid-season visit to Dubai, it’s a trip that would have broke a day-to-day monotony for these young men and helped some new faces immerse themselves in the group. And with the time away, Ronald Koeman and his staff would have been squared in on the remaining 13 games—that’s right just 13 games left—this season. It’s precious time too. 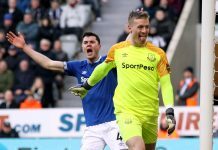 For fans two-week breaks may puncture the domestic calendar too regularly, but for managers, international commitments make a fortnight of Everton focus with an entire squad uncommon. Now must follow a performance against a former manager and a set of players who, despite their multiple flaws, will want to puff their chest out at Goodison Park. We last watched Koeman’s Toffees toil to a turgid point up in Middlesbrough. Not the worst display of the season, by no means the best, but the kind of point that can only be deemed acceptable on reflection if it’s bookended by home wins. If one positive came out of the stalemate, it’s that it’s becoming increasingly clear Everton’s best setup is with three central defenders. Not only are Ramiro Funes Mori and Ashley Williams constantly firefighting one another’s flaws in a centre-back partnership, the dearth of wide players in the squad and smorgasbord of central midfield options has seen the middle third of the pitch clogged. The width must come from a liberated Seamus Coleman and Leighton Baines as wing-backs. It’s a setup that suits all. Mason Holgate allows Funes Mori and Williams to concentrate on their own duties, the full-backs can sate their attacking appetite by bombing forward and up top, Romelu Lukaku is a much more ominous option with a partner. Although Koeman trimmed the squad in January, he still has big decisions to make in terms of personnel. Should he go with the 3-5-2 system, two of Ross Barkley, Idrissa Gueye, Gareth Barry and Tom Davies will likely miss out, with Morgan Schneiderlin already cemented as the midfield linchpin since his January arrival. Up top there are choices too. Kevin Mirallas, fitness permitting, has been a natural foil for Lukaku at times, but there’ll be a temptation to stick with the vibrant Ademola Lookman, a young man who, despite his recently profligacy, has a habit of making positive things happen on a football pitch. In the main, the manager has made the right calls in terms of team selection on home soil, with just one defeat at Goodison Park in the Premier League all season and 13 goals scored in the last three home games. With a squad more in line with the aggressive and industrious football he wants to play, it wouldn’t be a huge surprise to see more rotation in the weeks to come, starting on Saturday. We looked at how Everton should approach this game in this week’s podcast. Narratives aplenty to consider here, aren’t there? The bottom club in the table, a former manager returning and a clutch of ex-players back at Goodison. But put that natural Evertonian trepidation aside and it’s a match in which the Blues should stamp their authority. 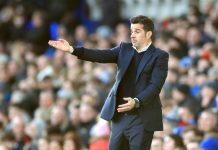 It’s clear Moyes is looking to kindle some team spirit after a January of mass recruitment, including former Everton defender Joleon Lescott on a free transfer, as well as Bryan Oviedo and Darron Gibson directly from Goodison Park. There have been some small signs of life since the mid-season window, most notably the remarkable 4-0 hammering of Crystal Palace away from home and a 0-0 draw with Tottenham Hotspur at the Stadium of Light. But a side packed with unfit and unfamiliar players will also turn in some moribund displays, as was the case in the 4-0 loss to Southampton last time out. 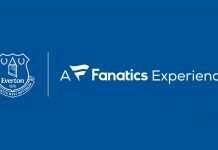 While Everton must jump on those physical and technical deficiencies at Goodison, they must also be wary of the threats Sunderland pose. Oviedo has excelled in his first two games for the club, summer target Lamine Kone is recovering some form and in Jermain Defoe, the Black Cats have a thoroughbred goal-getter. Moyes continues to be maligned in the mainstream media and among vast sections of the Everton fanbase, but Sunderland have made progress since a Lukaku hat-trick condemned them to a 3-0 loss at the Stadium of Light earlier this season. Crucially, so have the Scotsman’s former employers. For more on Sunderland, listen to The Blue Room Extra with Stephen Goldsmith. 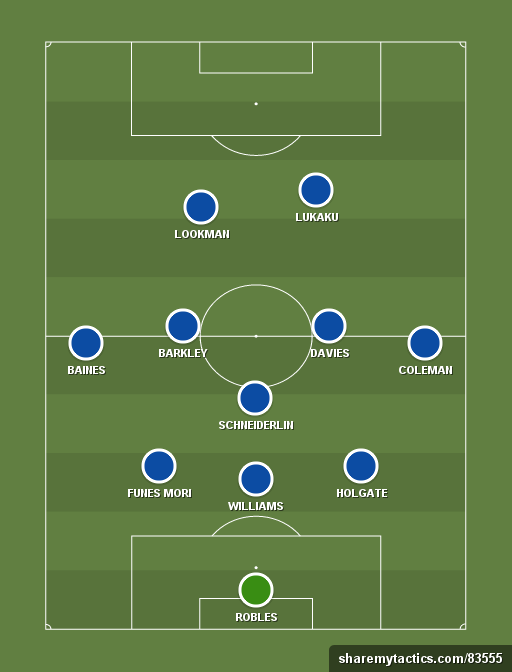 Matt Jones’ expected team to face Sunderland. Expect Gueye and Schneiderlin to form a crucial midfield axis during Koeman’s tenure, but after a poor display at Boro, the former should sit this one out. The Senegal international, fully recuperated after his Africa Cup of Nations commitments, will be a huge asset at White Hart Lane in a week’s time. Spot on with Rom. I was a kid with Latchford and Sharpy as a young man and both great forwards but Rom is a bettter finisher than both. Dunc is a legend for different reasons, even for his sendings off, maybe more a folk hero than legend but both to me. Rom stats show he is up there with our best, and hope he stay.s but if he goes we will soon appreciate what we had. Since Sharp who has been better. No one Case Closed.